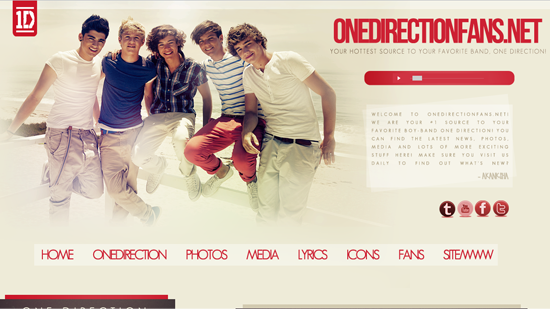 Welcome to OneDirectionFans.Net! We are your hottest source to your favorite boy-band, One Direction! I am Akanksha, the new owner of ODF, and I promise you regular updates, photos, media and lots of exciting stuff for you to browse through. Although, I need a little time to cover up the missing photos from the gallery. Make sure you check out all our networks! I am really excited to work on the site. All the layouts and coding were done by me throughout the site. I’d also like to thank Flaunt for hosting us. Make sure you follow us on Twitter and like us on Facebook and subscribe on Youtube! Keep visiting us daily! Welcome to the Oh Watson opening – your new source for the amazing actress from “Harry Potter,” Emma Watson. We aim to bring the latest news, images and more, we have still lots to add so please keep checking for updates. We are always welcome to donations (especially photoshoots & magazines) and give out FULL credit so email us your donations to ohewatson@gmail.com. I have re-opened my site about Nina Constantinova Dobrev – NCDobrev.us. Here you find everything about this amazing actress, latest pictures, news and more! I’m looking for elite and affiliates, so if you want to apply please email us ally@ncdobrev.us. Follow us on Twitter @NCDobrevWeb. MaggieQ Daily has just been opened, your newest premiere fan-source for the walking beauty, Maggie Q. You may know her as Nikita in the hit TV show that is currently airing on CW. Our goal is to provide you with your daily dose of the latest news, images, media, and much more. We are welcoming any members to help out with our site. We are recruiting a whole variety of people, where you can find more information at maggieqdaily.com/maggieqdaily-recruiting-agents. The requirements for being a co-owner is that you must be a fan of MaggieQ and be able to help post news on a regular basis. If you are interested or know anyone who may be interested, please email us at maggieqdaily@gmail.com and please help spread the word! We are also looking for affiliates! If you want to apply to be an affiliate, please go to maggieqdaily.com/website/apply-to-be-an-affiliates. We are more than welcome to become affiliates! I have opened Daniel Radcliffe Online; your newest resource for the amazing Harry Potter actor, you may know him from other movies. We aim to bring the latest news, images and more, we always welcome donations and give out credit so email us at dradcliffeonline@gmail.com and please visit again. We’d like to welcome you to the new Dream Of Gaga with our brand new theme from ShawnCorson.Com. Please take a look around the site, let us know what you think, we hope you like it as much as we do. Dream Of GaGa has been voted by the little monster awards as the fastest rising Lady GaGa fansite with more than 1,500,000 website views, 33,000 fans on Twitter and 830 likes on Facebook! Visit it now! Lady-Gaga.bz is looking for co-webs. The requirements are that you must be a fan of Lady Gaga, be able to upload pictures to the gallery and also post news. If you’re interested please e-mail Debs, the owner, at contact@lady-gaga.bz. We wish to clarify some issues concerning domains. As opposed to other fansite hosts, we do not require our users to transfer their domains to Flaunt Network. Prospective users may apply for our hosting services without the necessity of transferring the ownership of a domain. If you own a domain and still want to benefit from our services, you can do so! You will remain the full owner of your domain. We will not suspend your account and force you to transfer your domain to us! In case of any questions regarding this issue, do not hesitate to contact us. And by the way… Numerous users have asked us to create message boards. And now, we are happy to announce that we will create forums for our users. The boards will come very soon, and in the meantime, we are looking for moderators. If you are interested in becoming a moderator, do not hesitate and contact us at flaunt.nu@gmail.com. Good luck! We did not accept non-English fansites for several months, however, this has just changed! From now on, we will be accepting non-English fansites!!! If you are running a non-English fansite and are interested in being hosted by Flaunt Network, do not hesitate and apply now. Good luck!